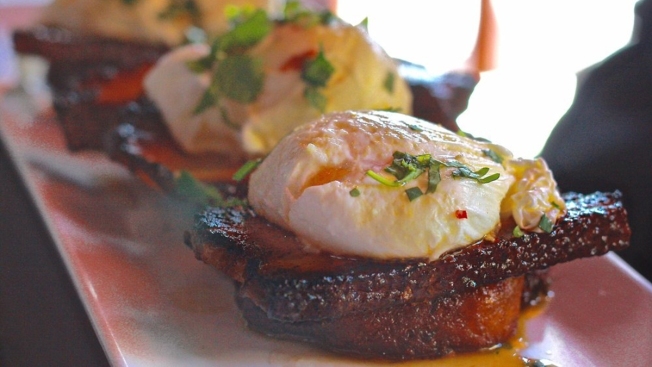 Yelper John B. captured this scrumptious snapshot of the Maple-Glazed Port Belly Benedict at Werewolf in downtown San Diego. San Diego has long been known for its breathtaking beaches and powerhouse craft brewing scene but, now, America’s Finest City is also ranking high among foodies. On Tuesday, Yelp released a list of the “Top U.S. Destinations for Food Lovers” and San Diego snagged the No. 5 spot. According to the list, San Diego’s current lineup of top-notch restaurants makes the city a draw among food enthusiasts. A couple of standout dishes – according to Yelp – include the Pork Belly Benedict at Werewolf in downtown San Diego, the Kimchi Dumpling Hot Soup at TastyPot in Kearny Mesa, and the Hot Chicken at Common Stock in Hillcrest. The Forbes Travel Guide list said a major highlight for San Diego was its rise as an up-and-coming foodie city with an influx of new eateries and noteworthy culinary talents (ahem, Claudette Zepeda-Wilkins, Brian Malarkey, Richard Blais) heading up local hotspots.